Yesterday, Xiaomi launched its Mi Note flagship phablet in Hong Kong. It marks the first time the Mi Note has been released officially out of China, indicating that the company may be ready to release the device to its other markets very soon. The Mi Note is Xiaomi’s first high-end phablet; it previously only had the 5.5-inch Redmi Note as a large-display option. Announced to much fanfare in January this year, the Mi Note is essentially a larger Mi 4, featuring a 5.7-inch Full HD IPS display, a 2.5GHz Qualcomm Snapdragon 801 chip with 3GB of RAM, 13MP Sony rear and 4MP UltraPixel front cameras, and a choice of 16 or 64GB of internal storage – there isn’t a microSD card slot here as well. Yesterday’s launch event in Hong Kong also revealed a retail price of HK$2,999 for the 64GB version, which translates to about RM1,470 based on today’s foreign exchange rate. The Mi Note Pro, however, remains exclusive to China for now. More importantly, this is a strong indicator that Xiaomi has ramped up production for the Mi Note to allow it to offer the device to its international markets. 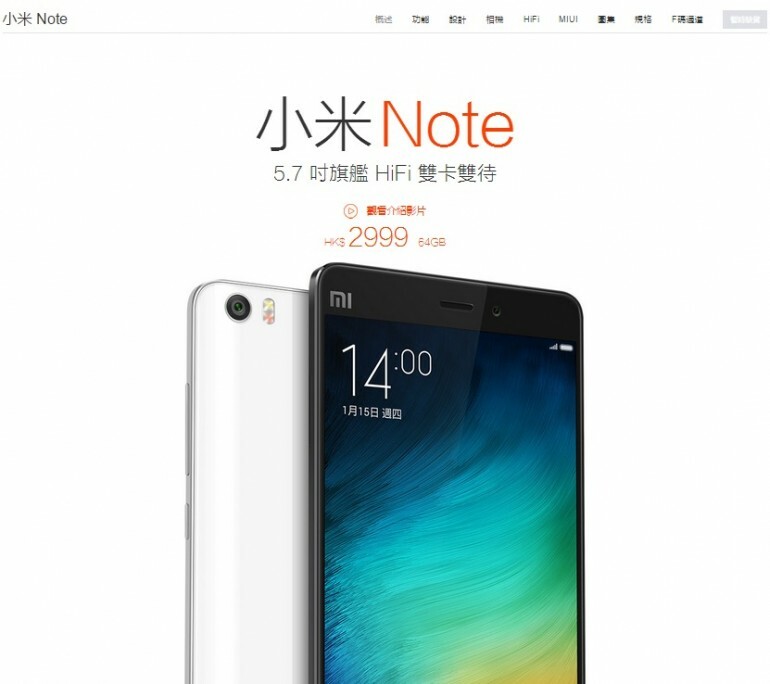 In Malaysia, the Mi Note passed its SIRIM certification as far back as April, while Xiaomi itself said that the device was supposed to hit Malaysia in the second quarter of 2015, which passed at the end of June. That said, the company’s Malaysian Facebook page has responded to individual queries about the Mi Note’s availability, stating that there has been some delays. That’s what we know for sure. On the other hand, an unconfirmed tip indicated that the Malaysian launch could take place as early as next week – if the Mi 4i’s global roll out is anything to go by, we’ll likely be seeing more Mi Note launches in South East Asian markets this week. Spec Sheet: Is The Xiaomi Mi Note The New King Of Phablets?